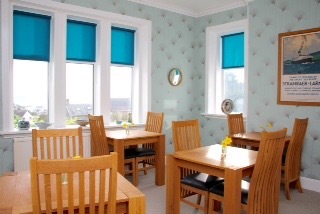 We are delighted to welcome you to our 4-star guest house in the harbour town of Portpatrick, Dumfries & Galloway in South West Scotland Portpatrick has wonderful sea views across the Irish Sea to Northern Ireland. Enjoy a luxury stay in the Factors Suite which features furniture crafted from reclaimed timber and prints from contemporary Scottish artists. Portpatrick is a beautiful village in Dumfries & Galloway - South West Scotland on the Irish Sea coast with views to Northern Ireland. Quiet country roads, unspoilt views - South West Scotland is ideal for cyclists with lots of interesting places to visit all within a 30 mile radius. Superb coastal walks along the Irish Sea coast with beaches, lighthouses and miles of remote paths and walks. 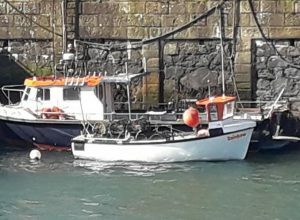 This busy harbour is home to the Portpatrick`s RNLI Lifeboat crew. The town itself hosts many related events and activities throughout the year. 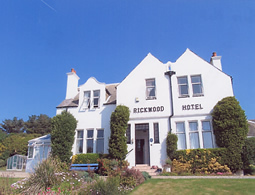 Rickwood is the only Visit Scotland 4 Star B&B or Hotel within Portpatrick Village. 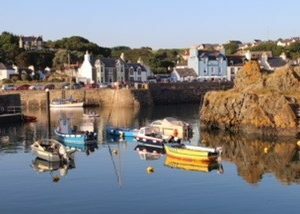 Situated in Portpatrick, a harbour side village on the coast of South West Scotland, Rickwood House combines quality B&B accommodation with comfort and good food with a warm welcome. Maggie & Fred Findlay have run Rickwood for several years. We describe ourselves as a Hotel Style Guest House – combining the facilities of a small hotel with personal touches and attention to detail of a quality Guest House or B&B. We have a residents license. We regret that for the time being we are unable to provide evening meals. There is a choice of seven or eight restaurants and pubs in Portpatrick. This is our quick guide to places to eat in Portpatrick . We are only a few miles away from Dumfries & Galloway`s top hotel restaurant – Knockinaam Lodge. Another of the regions top hotel restaurants- The Fernhill Hotel is just across the road. The ever popular – Campbell`s is only a few minute`s walk! 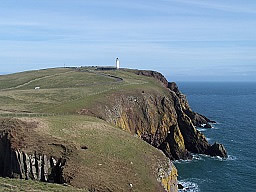 Mull of Galloway Lighthouse- Scotland’s Most Southerly Point. Spaces within our grounds for all our guests. Most parking in Portpatrick, Stranraer and Dumfries & Galloway is free! 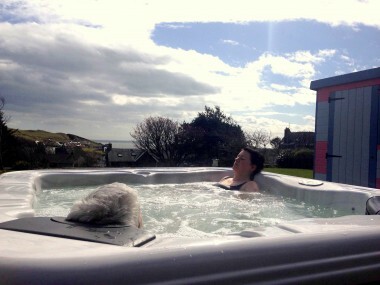 New for 2015 was our Vileroy & Boch hot tub. Great for a relaxing soak after a walk or a round of golf….. or for lying back and looking at the stars on clear nights. Children are made very welcome at Rickwood House B&B. High chair and cot available. We are pet friendly. Portpatrick is a delightful harbour village on the Coast of South West Scotland. The village overlooks the Irish Sea with Northern Ireland, beyond. Click here to find more about visitor attractions near to Portpatrick. We are on the recently created South West Coastal 300 Touring Route. Portpatrick is almost as far south as you can go in Western Scotland and about as far west as you can go in Southern Scotland! Enjoy a coastal walk or stroll along the harbour. 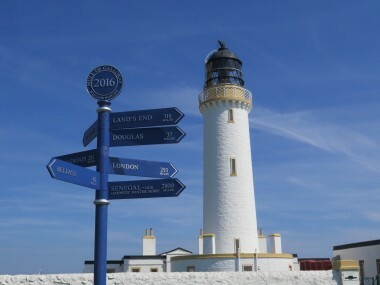 Discover Scotland’s most southerly point, the Mull of Galloway, or visit Scotland’s National Art, Food and Book towns. All these and more are within easy reach from Portpatrick. You can even stay with us and go on a day trip to the Titanic Centre in Belfast – we will be happy to provide an early breakfast. 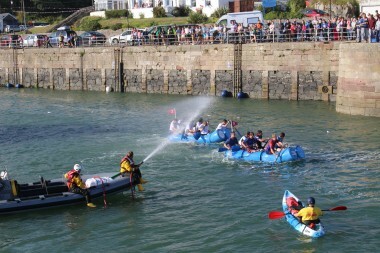 Portpatrick hosts various activities & events, from walking and cycling to Lifeboat Week celebrations and Portpatrick Folk Festival. 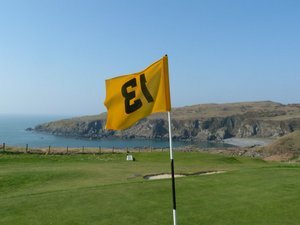 We are beside a superb golf course at Portpatrick. 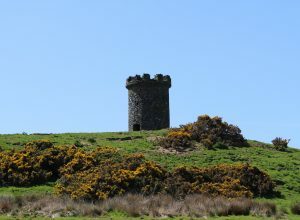 Stranraer Golf Club and Lagganmore are nearby. Slightly further afield are Wigtownshire County, St Medan`s, Newton Stewart and the famous Turnberry courses. We are No. 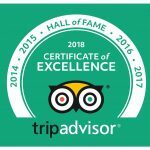 1 B&B or hotel accommodation in Portpatrick, South West Scotland on TripAdvisor. We are also in the top 10 for Dumfries & Galloway. Rickwood House is situated quietly, near Portpatrick Dunskey Golf Course. We overlook the village and the Irish Sea yet we are only a few minutes walk from the harbour and attractions of Portpartick. We are also handy for a short stay if you are going to Ireland on the Cairnryan Ferry or Loch Ryan Port and would like to see what South West Scotland has to offer. Our Guest House has been modernised to a high standard and offers quality accommodation in six stylish bedrooms. All have en-suite showers, some have baths also, well stocked hospitality trays and DVD players. Two are on the ground floor. Recently our heating system was upgraded to biomass so there`s always plenty of hot water. 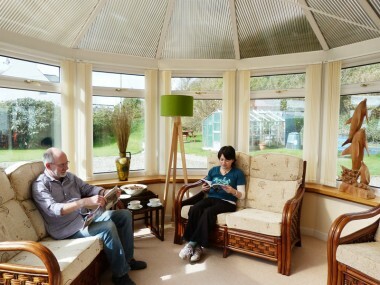 We have a conservatory lounge for our guests to relax at any time of day either with a drink or just to enjoy the view. We have a large garden with seating areas for your comfort and new for 2015 is our outdoor hot tub by Vileroy & Boch. Our master bedroom has been refurbished to a luxurious standard and is named the “Factors Suite” – to provide that extra touch of luxury. Please see our rooms & prices page for details. We also have a ground floor twin bedded room and king-size double room upgraded to a similar standard as The Factors Suite.